Teddy belonged to ten-year-old Aileen Rogers, whose father Lawrence left Aileen, her little brother Howard, and his wife Janet home on the family farm in Quebec when he went to war. Janet and Lawrence exchanged more than 200 letters during his service. Aileen and Howard also wrote their dad - and Aileen sent her beloved Teddy overseas to help protect him. Sadly, Lawrence died at the battle of Passchendaele. In 2002, his granddaughter Roberta Innes found Teddy and the letters in an old family briefcase. Her findings uncovered how a Canadian family's strength was tested by war and how a small stuffed bear became an enduring memento of their love. 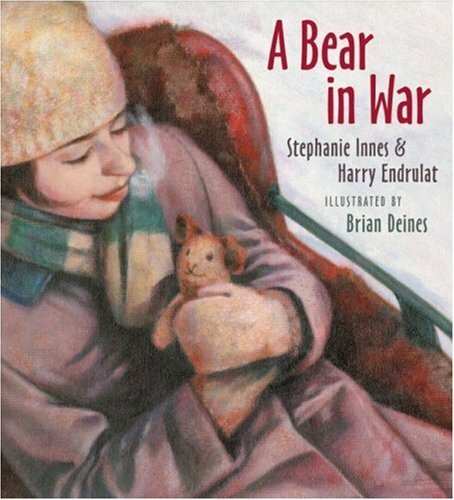 Sensitive text by Harry Endrulat and Roberta's daughter Stephanie, and Brian Deines' lovely illustrations bring this unusual story of love and war to life. About Harry Endrulat (Author) : Harry Endrulat is a published author of children's books. A published credit of Harry Endrulat is A Bear in War. About Stephanie Innes (Author) : Stephanie Innes is a published author of children's books. A published credit of Stephanie Innes is A Bear in War. About Brian Deines (Illustrator) : Brian Deines is a published author and an illustrator of children's books. Some of the published credits of Brian Deines include SkySisters, Camping, On Uncle John's Farm, and The Hockey Tree.